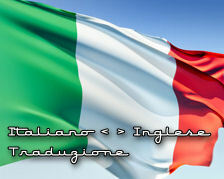 Translation is the necessity for today’s world and we are providing the Italian translation in its best possible way. We employ only the very best Italian translators the world has to offer. They are meticulously screened during our rigorous selection process so that only specialists having the best qualification, industry experience and subject expertise handle your translations. We only work with dependable and experienced translators who consistently display superior performance and quality results. We ensure that the Italian translators assigned to your project have the appropriate expertise required to provide you with a high quality, culturally sensitive translation in any field that you desire. Italian Translation Fields: Document Translation ( IT Manual, Software Manual, Multilingual User Manual, Technical Script and Manual, Training Material, Medical Documents, Engineering Documents, Marketing & Advertising, Legal Documents, Literatures, Official Papers, Tourism, Sports), Website Translation, Software Localization, Multilingual Web Publications, Web Content management and translation, Print Publications. Italian (italiano or lingua italiana) is a Romance language spoken by about 63 million people as a first language, primarily in Italy. In Switzerland, Italian is one of four official languages. It is also the official language of San Marino. It is the primary language of the Vatican City. Standard Italian, adopted by the state after the unification of Italy, is based on Tuscan (in particular from the dialects of the cities of Florence, Pisa and Siena) and is somewhat intermediate between Italo-Dalmatian languages of the South and Northern Italian languages of the North. The history of the Italian language is long, but the modern standard of the language was largely shaped by relatively recent events. The earliest surviving texts which can definitely be called Italian (or more accurately, vernacular, as opposed to its predecessor Vulgar Latin) are legal formulae from the region of Benevento dating from 960-963. What would come to be thought of as Italian was first formalized in the first years of the 14th century through the works of Dante Alighieri, who mixed southern Italian languages, especially Sicilian, with his native Tuscan in his epic poems known collectively as the Commedia, to which Giovanni Boccaccio later affixed the title Divina. Italian is the official language of Italy and San Marino, and one of the official languages of Switzerland, spoken mainly in Ticino and Grigioni cantons, a region referred to as Italian Switzerland. It is also the second official language in some areas of Istria, in Slovenia and Croatia, where an Italian minority exists, just as in the Croatian city of Rijeka just outside Istria. Italian to English Translation services India - Italian Language Translators - Cost effective Translation Network - Kolkata Translation - Website Localization India - Kolkata Translators - Italian Content Writing India - Italian Language Professionals Kolkata.